To keep your car running at its best its important to take care of it. Regular maintenance is a must to not only check that everything is functioning correctly but also to detect any issues as early as possible. One thing that is very crucial to maintenance of your car is getting its oil changed regularly. We consulted our Certified Mazda technicians about about the benefits of using a synthetic oil vs a regular oil, but before we go too deep into that its worth us briefly discussing the main advantages of oil in general. The main function of oil is to reduce friction between the different moving components in the engine. Allowing the different components to move smoothly against each other greatly reducing the wear and tear on the components allowing them to function properly for longer. Oil filters also reduces harmful deposits that might accumulate within the engine and impact its performance. The brief video below gives a quick overview of how engine oil works and how it is distributed throughout the engine. Now that we know the crucial role oil plays in the functioning of an engine lets now focus on the specific benefits of using a synthetic oil. A very crucial benefit of synthetic oil over regular oil is that it flows easier in cold weather, very important considering our cold Canadian winters. Lower temperatures make lubricants significantly more viscous, making them harder to move around. This negatively impacts how well they lubricate the constantly moving gears and bearings within the engine, increasing the friction of these components as well as the wear and tear. Synthetic oil has to be changed less frequently with change intervals recommended between 7000km to 10000km. At Angevaaare Mazda we recommend having an oil change every 8000km or 6months for Mazda vehicles model year 2016 and newer. We recommend that older Mazda vehicles be brought in for an oil change every 4months or 8000km. Longer change intervals also have the added environmental benefit of producing less oil waste. Synthetic oil also tends to slightly improve horsepower and torque due to less initial drag on the engine because of improved lubrication. This also has the benefit of slightly improving fuel economy as the engine runs more efficiently if its components have less friction between them. These are some of the benefits our team of engineers put together to help you understand the benefits of using synthetic oil. 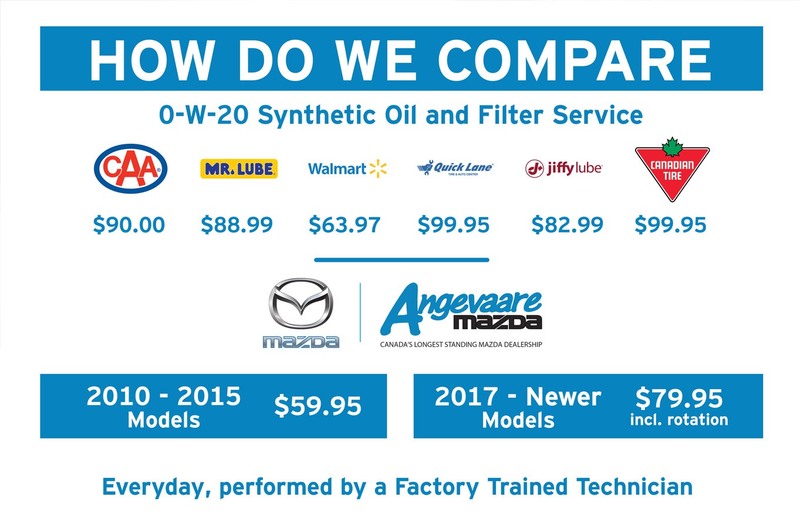 At Angevaare Mazda we understand the importance of having your vehicle running at its best and to make it easier for you we have extremely competitive rates for an oil change. View the sheet to see how we stack up against the competition.